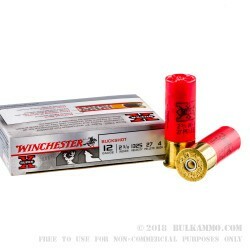 This #4 buck 12 gauge ammo from Winchester’s Super-X line is a fantastically versatile load that is suitable for a wider range of animals in the field than most loads. It is also a very good home defense load for most scenarios where a larger projectile would be too much (like a close urban setting or where you have a specific home layout that puts your loved ones into the path of the projectile. 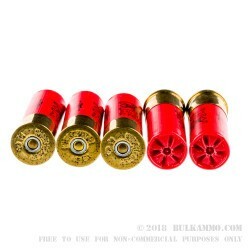 The #4 size is more readily absorbed by wall board and framing studs and the stopping power is still more than sufficient for most threats while offering great pattern mass and density at a good set of ranges. The effectiveness of the load at between 10-40 yards makes it very effective in a personal home defense scenario and makes it an obvious choice for larger game in the field where shot distances can range up to 45 yards or so. The high base ensures excellent reliability in the semi-auto shotguns and the quality of manufacture allows for multiple reloads. 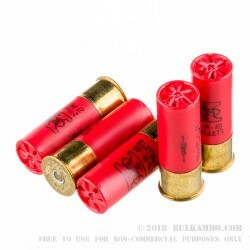 The 2 ¾” shell length offers a 27 pellet #4B payload that is perfectly mated to most chokes and for intermediate distances on intermediate to larger game.